This individual Report Response to Online Banking Crunch Demands New Technologies & Improved Segmentation is available for purchase. 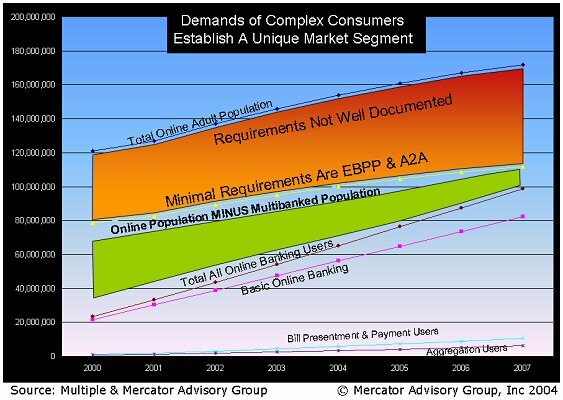 This Report is available to members of Mercator Advisory Group’s Debit Advisory Service. Please be advised that this Report is normally part of a research and advisory service that provides ongoing support throughout the year. As such, this Report contains significant depth of content that is selected for its strategic importance to our members. (For a description of these services, see our Advisory Services section). Online banking adoption is growing at more than 35% a year across all market segments; basic online access, Electronic Bill Presentment and Payment (EBPP) and Account Aggregation. At the same time, the growth in the number of online adults is slowing as America approaches 80% saturation. The market for online banking will become more competitive over the next four years and the ultimate market crunch is closer than assumed for the unprepared. The online banking market will go through additional consolidation and online services more carefully designed to meet the needs of specific target customers. "Complex consumers have income deposited across multiple financial institutions and each family member is likely performing online functions at the financial institutions they favor. Identifying these multibanked consumers is the critical first step in establishing a program that will better capture the financial bandwidth of these profitable consumers. Providing services that satisfy the financial needs of these complex consumers is also critical and this starts with account-to-account transfers and EBPP. Financial institutions that limit the complex consumer's fluidity by resisting A2A solutions are in danger of being fluid in only one direction -- OUT. Relative to EBPP, current solutions need to be enhanced to make the process of selecting billers easier and aggregation will be an important tool by which the financial institution can better understand its position relative to all of the financial activities the complex consumer is involved in." The report is 31 pages and contains 5 exhibits.